There are 3 different types of hold entries that have been developed to get you headed in the right direction on the holding course without excessive maneuvering. 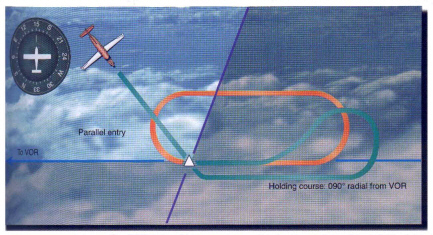 The entry you use depends on your magnetic heading relative to the holding course when you arrive at a fix. Standard entries are right hand turns and are shown below. Fly across the fix and turn right to the outbound heading and then continue the pattern. After crossing the fix, turn to a heading that is approximately 30° away from the holding course outbound on the holding side of the pattern. Fly this for one minute then turn right to intercept the holding course inbound and return to the fix. After crossing the holding fix, turn the airplane to a heading that parallels the holding course and begin timing for one minute. 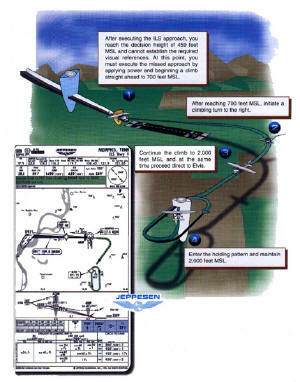 Begin a turn and return to the fix or reintercept the course from the holding side and proceed to the holding fix.